This is my little library. I must've bought over 100 books in the past 6 months. I can't resist when they're for a dollar or two. And I've got more in boxes. I haven't invested in something larger to house them in because I'm planning to move in a couple months. Away from this beautiful, brick wall abode, to a slightly larger place down the street, unfortunately, with no brick walls. So for now, they are taking over my dresser which interestingly, is starting to mirror the brick walls. I'm digging around for shelving inspirations. 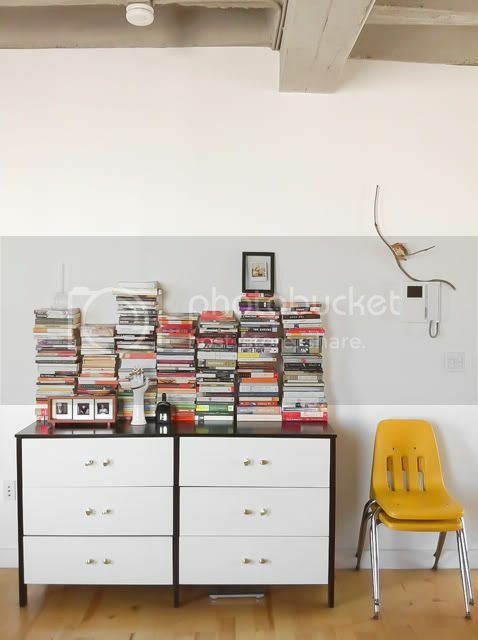 I want wall–to–wall shelves, something like this.